There are virtually as many types of staplers as there are uses for them. Staplers are produced for use in: the manufacture of furniture; medical fields; carpet tacking; electrical wire and insulation installation; picture frame manufacture and, of course, in the home or office. The size of staplers ranges as well—from a mini stapler (as small a finger) to one requiring two hands to use. And while there is no specific standard size of staple, the basic household (office) type—with a wire size of. 017 of an inch in diameter—is generally accepted as typical. The average multi-use stapler operates with wire sizes averaging. 050 of an inch in diameter. Staplers used in the construction industry utilize what resemble nails that come in preloaded magazines (packets)—similar to firearm ammunition and probably almost as deadly at short range. Even with the potential of dozens of uses, staplers are most frequently used in binding multi-page documents and other such related office tasks. They are extremely inexpensive: a "typical" home or office stapler costs less than $10.00, and a packet of 5,000 staples, less than $2.00. The most recent staplers are being made almost entirely of plastic. Currently, however, the most popularly used staplers are still those made of metal. Thus, the following focuses solely on the metal stapler and how it is manufactured. While staplers are produced for a number of different uses and in just as many sizes, the basic principles behind the workings of each remain the same, and the chief components (springs, stampings, rivets, moldings, and pins), once completed, are assembled to create similar finished products. 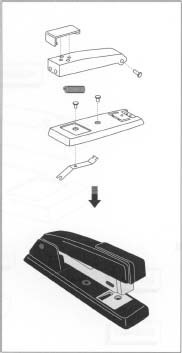 The parts of a stapler are formed in various ways before coming together to form the finished item. Coil springs such as the follow spring are wound around rods and heat-treated, while leaf springs such as the clearing spring are rolled or bent to their proper shape. Sheet metal parts such as the head and base are typically stamped between a punch and die, while plastic parts can be injection molded. sized rod (similar to winding a thin wire around a pencil) and is then heat-treated to a produce changes in the metal's characteristics—changes that give the metal "elasticity." The heat-treated coil spring can be pulled apart and pressed together, within reason, and still return to its original wound up condition. A good example of a coil spring is the follow spring, which connects the case to the follow block —the metal piece in the magazine that holds the staples toward one end of the magazine. 2 Leaf springs, which resemble a diving board, are typically made by either bending or rolling (slightly curling) a thin piece of steel and then carefully heating it to a temperature that will cause internal stresses. Thinly slicing a carrot lengthwise into strips and then placing them in ice water causes the strips to curl up; this is the same effect observed when springs are properly heat-treated. The steel maintains either a curled or flat position and resists any bending motion applied to it. One example of a leaf spring is the clearing spring, the part on the underside of the stapler that allow you to unlatch the base from the upper assembly (the magazine and metal head). The pins, stampings, and springs are subassembled in stages and then assembled together with the upper and lower halves of the stapler frame. The last items to be assembled are the feet lanti-skid rubber pads) and the snap-on plastic cap. the form of a coil of material that looks something like a roll of paper towel. (The material type and thickness depends on the configuration of the part being made). The coil allows automatic feeding of the material across a punch and die using a coil feeder. The coil is gradually unwound as parts are stamped out of it. This is a very cost-efficient way of mass producing stampings because it does not require an operator to hold the material between the punch and die. Most of the major metal components besides springs and rivets, such as the base, metal head, and anvil, are made in this way. 4 After a part is stamped, it is usually then formed into a shape. If the shape is an intricate one, another type of punch and die is used. The material may also be heated in order to soften it, allowing the material to bend more easily. Most stapler parts have somewhat square corners, so typically the material is bent at 90 degree angles. There are now machines that perform stamping and brake forming processes during the same operation; they simultaneously punch out shapes and bend them to make the appropriate parts. This eliminates the amount of setups and different machines required to make all of the parts. 5 A rivet is usually made of a fairly strong steel material, but it must also have some elasticity. A rivet is designed to hold parts in place just like a screw and nut, except that the rivet is one piece and cannot be easily disassembled. One end typically has a head on it (like a nail or a screw), and the other end is usually hollow (either partially or along the whole length). Rivets are made by cutting off a piece of bar stock and forging it to obtain the desired configuration. Forging is a process similar to stamping, except that the starting material is almost to size already. Forging will minimally change the size and shape; the strength of the material, however, is significantly increased. 6 Plastic parts of staplers are made by injection molding, in which a liquified plastic is injected into a die. The liquid flows into the open void and is then cooled. As the die cools, the plastic solidifies and takes on the shape of the die. The die is opened and the part is removed. 7 The pin is little more than a piece of bar stock, cut off to a certain length either with a saw or on a machining center. Because the pin is used as a hinge point for the top and bottom half of the stapler, it is usually made from a strong, heat-treatable metal. 8 As required to prevent rust, or for cosmetic reasons, some of the components are painted. The parts are hung on small racks, set on a conveyor and passed by a spray nozzle. Some automatic painting operations employ electrostatic spraying, wherein the parts and paint are electrically charged. The paint and the parts are given opposite charges—for instance, the paint will be given a negative charge while the part will be given a positive charge—because opposite electrical charges attract each other. Electrostatic painting ensures that every possible space on the part will be evenly painted. This method also eliminates wasted paint (overspray). 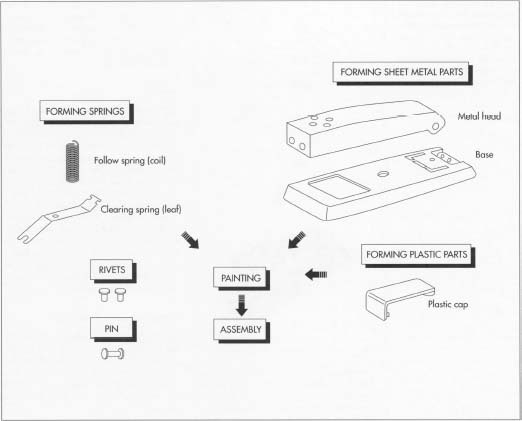 9 The pins, stampings, and springs are subassembled in stages and then assembled together with the upper and lower halves of the stapler frame. For the bottom subassembly, consisting of the base, hanger, anvil, and clearing spring, the parts are placed in an assembly jig that holds them in position to allow the rivets to be placed in the correct holes. Once the rivets are locked in place, a tool called an orbital riveter spins the hollow end of the rivet until it collapses outward and captures the parts together. The top half, consisting of the magazine subassembly, the case, the follow spring, the driver-ram spring, and the metal head, is assembled the same way in it's own assembly jig. 10 The top and bottom halves come together in another jig, and the pin that connects the two is riveted into place. Finally, the finishing touches such as the feet (anti-skid rubber pads) and the plastic cap are then snapped on. Samples of all the components are tested individually as they are manufactured. A certain percentage of parts are thoroughly checked as they come off of the automatic machines. Critical dimensions are scrutinized and adjustments are made to the machines or the tools are repaired/replaced as they wear out. Once the parts are assembled, they are sample inspected for functionality and again a small number of units are continuously cycled until they wear out. The component that wears out is checked for conformity to determine whether it was normal wear or a design flaw. An important item determining longevity and product warranty is the use of factory recommended staples. The use of incorrect staples is said to be attributed to cause the majority of stapler malfunctions. It should be noted that some stapler companies will service their staplers (for free or a nominal fee) only if their staples, exclusively, are used in the unit. Staplers, like most other mechanisms, are continually adjusted and improved upon. As new materials and processes are developed, many uses become incorporated into all kinds of products, the stapler is no exception. Likewise the use for staplers will continue to increase as one of the latest uses is in the medical field as a substitute for stitches. Ewers, William. The Staple Gun in Home and Industry. Sincere Press, 1971. Capotosto, Rosario. "Pop Goes the Stapler." Popular Mechanics. August, 1987, p. 19. "Now, a Stapler Can Become a Riveting Tool." Consumer Reports. February, 1987, p. 73. McCafferty, Phil. "Plastic Nails." Popular Science. April, 1987, p. 66. The outward pointing staple or "OPS" as we sometimes call it, has the advantage of being able to accomodate more sheets of paper. Your local office supply shop would probably be glad to give you a demonstration.